Plaid shirt: Subi. White t-shirt: Star Cross [ local clothing line ]. Shorts: MCM jeans. Casual Sandals. Watch: Levis. Eyewear: Ray Ban. Please follow my blog [you can use google acoount or blog lovin'] and if you want please follow my twitter [you can click in my twitter buttons]. I think your new hairstyle is cool Echa ! 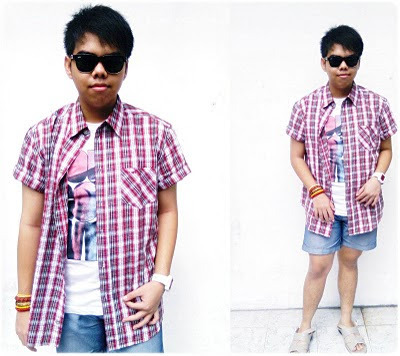 And the outfit makes you look cooler :D Love the plaid shirt ! :) Have a nice weekend ! Love your style and the pics you take.Thanks so much for your lovely comment! thanks for stopping by my blog, and your hair style looks great. love the ray bans too. the new hairstyle looks good on u echa ! echaaaa ! I got an award for you!